Renxkyoko Iglesias here, wishing you all a Happy New Year ! ! And it’s not some government – sponsored spectacular fireworks display……. anyone with a pocketful of change can buy fireworks and shoot them up on New Year’s eve. The one on the video is just a small area of Metro -Manila. The fireworks on the ground are worse. The Judas belt….. sheesh . Even though there are so many injuries , the government can never make this illegal….. it’s like making eating adobo illegal, too. By the way, international flights going to the Philippines are cancelled on New Year’s day. ….. the haze over Manila is deadly for arriving planes. Over here in the US, we can hear a pin drop on New Year’s eve. It was a culture shock on our first New Year’s eve in the US. Oh, well. Happy New Year, everyone. And to my Filipino readers, be safe. First off, I would to greet everyone a Happy Christmas ( to Christians ) and Happy Holidays ! ( to non – Christians ). Whoa ! ! Sorry it’s a huge photo…. can’t make it small, for some reason. I think my mind hit a brick wall. The greetings above has been sitting in my draft folder for 3 days now, but I still cannot think what else about Christmas that I can write about. Anyway, I ‘ve been reading about how other countries celebrate Christmas. I was surprised that even non-Christian countries like Japan, Indonesia, Taiwan, and Singapore have their business establishments ( malls, etc ) all bedecked with Christmas holiday decorations. I do not begrudge them the excellent business they’ll get from people that do celebrate Christmas. I am, in fact, glad that this Christmas holiday tradition is not banned in their countries, unlike in some countries the names of which I shall not mention. Be that as it may, I feel a bit sad that the real meaning of Christmas is deeply buried in the murky sea of commercialism. For some reason, Christmas always reminds me of the ” The Little Match Girl. ” I seriously want to erase this off my mind. So, how does a family of Filipino- Americans celebrate Christmas ? We try to keep the Filipino tradition close to our hearts. 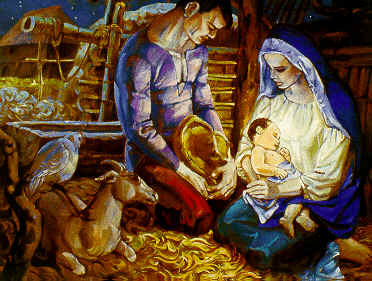 We attend the Midnight Mass on Dec. 24 and partake of the Noche Buena ( Midnight dinner ) after Mass. Below are my folks going to Midnight Mass last year. I think I need to write about the Philippines ‘ unique Christmas tradition on my next post, hopefully just before Cjristmas Day., fyi. This is all for now folks. Again, a Happy Christmas and Happy Holidays ! Peace and Goodwill to all !